Last night we had a collection of people – friends and family – come over to hear the interview with Lisa Jensen of SafePassage, and see the goings-on in Second Life. It was an interesting time! Afterwards, we had food and drink, talked about it all and just enjoyed the company. All part of Dining on the Peace Train. In the meantime – I hope you continue to enjoy the scheduled events for PeaceFest 2010 and help us help these fine organizations. PeaceFest 2010 – See One World! Today – it’s all happening at Music Island. A huge thank you to Kate Miranda and all the performers. Here you see AldoManutio Abruzzo performing this morning. See the Schedule for what’s happening for the rest of the day! A big “thank you” as well to Any1 Gynoid for covering our story in the CNN iReport site. Thank you! Divine Rhythms of Universal Music (DRUM) – an amazing show featuring drum styles from various cultures – African, Native American, Japanese and Latin. An impressive combination of coordinated actions and sound, it was incredibly enjoyable! Thanks very much to the DRUM group for helping us See and Hear One World! Check it out! “Like” it, and share it through Facebook, etc. Also – we’d also like to thank the very kind folks at AviewTV who are providing video recording / streaming services for PeaceFest 2010. THANK YOU, AviewTV!! You are helping us help many others! For more about AviewTV, please see their website. You can imagine the number of communications and the amount of preparation that goes into putting THIS LIST of events together! We’re thrilled to start PeaceFest today – and what better way than with a live interview with our friends in Kigali Rwanda (technology permitting!) . I will record the conversation and will post a link here later for those that can’t be there. For those in Second Life, we’ll be here (SLURL) for the interview. Come ask your questions! As you know, we’re going to be donating to 3 organizations this year. I am really excited to have already secured time with both SafePassage.org and UMUSEKE for live interviews! These interviews will be handled by Skype and streamed online through Blogtalkradio and in Second Life. 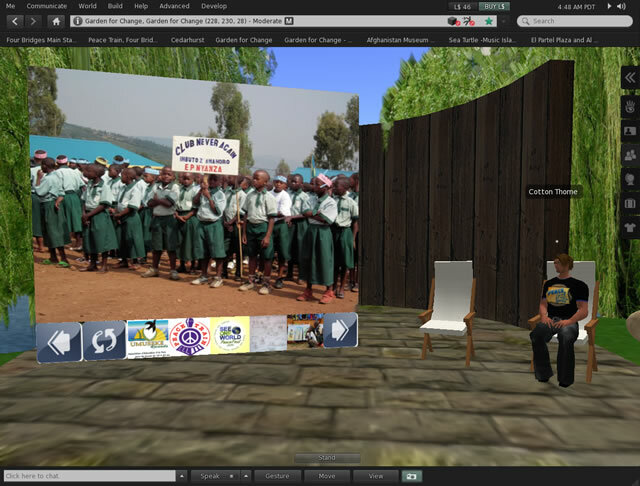 For those in attendance in Second Life, we’ll have presentation panels running to share photos that the folks from these organizations have already shared with me – photos from Guatemala and from Rwanda. I’ll add just a couple samples here, and take a look at the SCHEDULE as we get close to November 5 to see the latest. NEW idea this year! Dining on the Peace Train. As many will know and will have gleaned from this blog, our history is one of creating online events in Second Life only. Well this year we are expanding into the real world! I was talking with a friend a couple of weeks ago and we came up with the idea of having small get-togethers – just friends or family coming together in someone’s house, apartment, dorm room, bar – whatever. Small get-togethers where folks could have some fun and share information about the three organizations we are supporting, about Peace Train, and gather donations. So that’s the genesis of Dining on the Peace Train : ) Another way to hop on board! More information here.